Published: August, 2007. Last Updated: April, 2011. 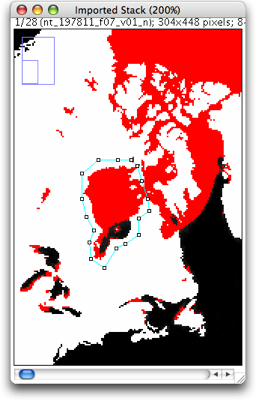 This image, produced in Image J, shows the thresholded sea ice extents. In this chapter, you will take on the role of a student from a small town in Colorado. You will then team up with students from the town of Churchill, Canada to explore changing sea ice conditions in the Arctic. Examine an animation that shows 30 years of satellite images to see how the extent of sea ice in the Arctic has diminished over time. Next, you will measure the extent of the sea ice in November of each year, import your measurements into Microsoft Excel, create a graph, and interpret it to predict when the sea ice will be completely gone. Download and graph temperature data for the same time period and look for potential causes of the change in sea ice extent. Last, you will apply your new image processing and analysis skills to research the changing sea ice extents in other regions of the Arctic. This chapter's storyline is built around the real-life case study of Dr. Walt Meier, a Sea Ice Scientist from Boulder, Colorado. In the fictional story, the students of Churchill become concerned about wildlife in their region because polar bears have become a nuisance in the town. According to the local elders, the sea ice patterns have changed. The students turn to Dr. Meier for his expertise in sea ice analysis. Dr. Meier then instructs the students in the use of ImageJ and guides them through the research process.